Breakdown cover Ireland and NI - No mileage limit! 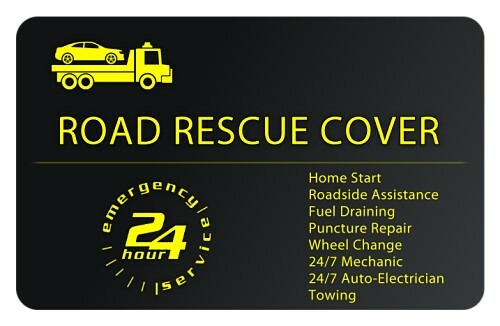 Breakdown cover Ireland and Northern Ireland for all cars, all drivers. If you’re in need of assistance, call our dedicated call center any time, and a recovery operator will be with you asap! Here we explain exactly what you get with your breakdown cover membership. And that’s a promise! We change the punctured/damaged wheel with your spare wheel. We tow your vehicle to a location of your choice. If the car won’t start for whatever reason, we will attempt to get your car started. We call it home start, but we attend to your vehicle at any location, not just outside your house. We will attempt to fix your vehicle at roadside. If unsuccessful we will tow you to a location of your choice. We attend to the road rescue anywhere in Ireland and Northern Ireland. A single car breakdown recovery can cost you upwards of €50. With our breakdown cover, you get 3 call-outs for only €23! We are part of a nationwide network of approved auto-recovery operators, so there’s always a recovery truck near you, wherever you are. Once you vehicle has a valid NCT, your vehicle is covered irrespective of how many miles are on the clock. In the eventuality of a breakdown, passengers will be accompanied to the their nearest destination. You wont get left stranded. When you call our dedicated call center on the operator will dispatch the nearest recovery team available. Under the terms, conditions and exclusions of this breakdown membership, we will arrange for your vehicle to be taken to the nearest repairer, secure premises or, if nearer, your home. This service is provided throughout Ireland and Northern Ireland. Please note, that if you should engage the services of any recovery operator prior to making contact with the Helpline, any costs that you incur are not covered by this membership. If your vehicle breaks down, we will send a PSV operative or appointed agent to assist you. We will provide assessment on the breakdown. If your vehicle cannot be repaired in site, we will tow it to the nearest competent repairer or tow to your own garage if closer. If your vehicle breaks down or is involved in an accident away from your home, we will send a recovery operator to assist you. We will provide assessment on the breakdown on arrival of the PSV operative or appointed agent, if your vehicle cannot be repaired on the spot, we will arrange to tow it to the nearest competent repairer, recovery yard or your home if closer. If your vehicle suffers a puncture whilst driving, we will assist with the replacement available with the vehicle. Accompaniment of the passengers of the vehicle and member, if possible (depending on the passenger capacity of the assisting recovery vehicle) to their nearest destination. The member will be entitled up to three assists during annual membership. PSV shall not be liable for any liability or direct loss arising from any act performed in the execution of services provided to the member. PSV shall not be liable to pay for expenses which are recoverable from any other source. PSV shall not be liable for any accident or breakdown brought about by any avoidable willful and deliberate act committed by the member. PSV shall not be liable for any repairs to the member’s vehicle. PSV shall not be liable for the costs of any parts, keys, lubricants, fluids or fuel required to restore the vehicles mobility. PSV shall not be liable for any claims caused by fuels, mineral essences or other flammable materials, explosives or toxins transported in the car. No services shall be payable unless PSV has been notified and has authorized services through the medium of the emergency membership number provided. Territorial limits of cover are the Republic of Ireland and Northern Ireland. PSV will not be responsible where it is asked to provide the service for a fault that was dealt with with in the preceding 28 days, excluding punctures. Members can only be provided with the benefits if the registered vehicle was in a roadworthy condition prior to the incident. PSV will endeavor to provide all the benefits associated with this membership however, all the options may not be available to us at the time of the breakdown. At all times we will retain the discretion to provide member benefits outside of the cover purchased by the member and dependent upon the circumstances. The member must be with the vehicle when the recovery agent is tasked, if they are absent any subsequent assistance will be at the members own cost. We may refuse benefits in circumstances where the member is clearly intoxicated or the vehicle is in an inaccessible off road location. No benefits will be provided if the vehicle does not hold a valid NCT when required to do so. No benefits will be provided if the vehicle is already at a place of repair. PSV may not be able to provide benefits where a vehicle is immobile due to snow or ice. We hope you are happy with the benefits of this membership. However, if after reading the benefits provided, this membership does not meet your requirements, please return it to the agent / PSV within 14 days of issue and we will return your membership costs. PSV will not be bound to renew this membership and may at any time cancel the membership by sending 14 days notice to the member at their last known address. Provided the membership has been paid in full the member shall be entitled to a proportionate rebate of membership costs in respect of the unexpired period during which benefits apply. If you wish to make a complaint about our services, we have a formal complaints procedure. In the first instance you may contact us in writing or by phone.